Google now supports showing livestreams in the search results and in Google Assistant. 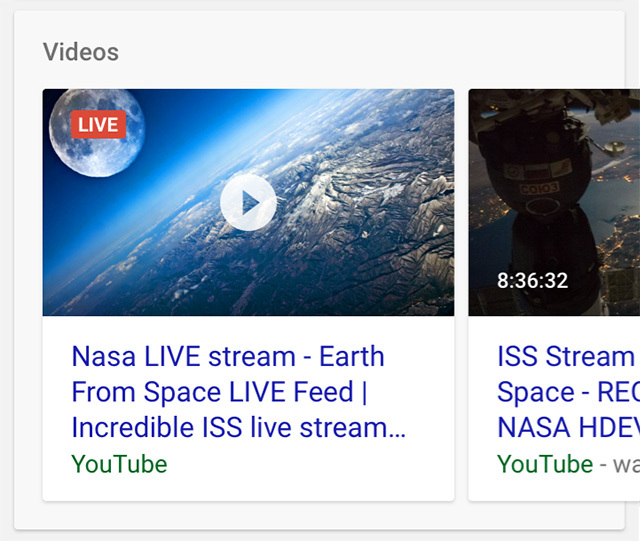 Google added structured data to help Google understand the information in the live stream and also added using the Indexing API to support communicating the new live stream to Google quickly. As I covered at Search Engine Land yesterday this is designed for live streams with content like sporting events, awards shows, influencer videos, video games and others. There are two components to making this work, outside of the obvious - that you need to produce live video streams. (1) Structured data for livestreams - the markup. Google is requesting contentUrl, description, embedUrl, name, thumbnailUrl, uploadDate and publication. Google also asks, if you have it available but it is not currently required, duration, expires, interactionCount. And for broadcast events also endDate, isLiveBroadcast, and startDate. (2) Indexing API not only supports job posting URLs but now for these live streams. Simply because they of live nature and Google wants to be aware of these streams as soon as possible. Google said "We recommend using the Indexing API to ensure that Google crawls your livestream quickly." Call the API for when the video goes live, when the video has stopped streaming, and the page's markup has been updated to indicate the endDate and whenever a change has happened in the markup and Google needs to be notified. So now we have the live label back in addition to the live label in blog posts.